Welcome to the complete Borderlands: Game of the Year Edition Shift Codes list. This guide will stay up-to-date to help you find the newest valid-in-2019 Shift Codes for PC, PS4 & Xbox One. As you may expect, the majority of this page will act as a Borderlands 1, 2 & The Pre-Sequel Golden Key Codes list. The below listed Shift Codes are promo codes that will unlock special items in-game. After entering a Shift Code, you may receive: Custom Character Skins, Custom Character Heads, Special Mods (and other goodies like Loot), and often Golden Keys that open a special Gold Chest which in return can give you rare weapons and other powerful items. Shift Codes that have been struck through have expired. Scroll down further for valid ones. • Shift Code #1: Unknown Code. Expiry Date: This Shift Code may not expire, as it’s from the bottom of the new “Borderlands: Tiny Tina’s Robot Tea Party Card Game” inside box. Also it’s not known what game this works with, but likely Borderlands 1. • Shift Code #2: You get 5 golden keys with this SHiFT Code. Expiry Date: This Shift Code may not expire, as it was an apology for launch week connectivity issues. In fact, at the time you could not claim this code online, but only in-game. • Shift Code #3: You get 5 golden keys with this SHiFT Code. • Shift Code #1: You get 100 golden keys with this SHiFT Code. Expiry Date: It’s not known how long this Shift Code is valid for, as it was given out by Gearbox in chat during the Borderlands GOTY reveal livestream. Expiry Date: Works until April 15, 2019. • Shift Code #1: You get an exclusive In-Game Skin with this SHiFT Code. Expiry Date: Unknown, as it was given out by Gearbox in chat during the Borderlands GOTY reveal livestream. Expiry Date: Works until April 8, 2019. Expiry Date: Works until April 22, 2019. • Shift Code #4: You get 5 golden keys with this SHiFT Code. Expiry Date: Works until May 6, 2019. Returning Player Rewards: With the addition of the SHiFT player rewards program to the original Borderlands, you can now use Golden Keys to unlock special in-game items and rewards. Returning SHiFT users who’ve played Borderlands 2 or The Pre-Sequel on the same system will receive 75 free Golden Keys, as well as two randomly selected all-new weapons, for their first newly-created Vault Hunter in Borderlands GOTY. • Step #1: You’ll need to register a SHiFT account at the http://shift.gearboxsoftware.com website, then fill out all the account details and sign in to your new SHiFT account. • Step #2: Start the game, and from the Main Menu go to “Extras” and select “SHiFT Codes”. Then link your SHiFT account to your Xbox Live account (for Xbox 360 users), PSN account (for PS3 users) or Steam account (for PC, Mac & Linux users). Just follow the on-screen redemption instructions. A) Shift Codes will expire after a set amount of time. Usually after one week (but it can also be after one day). We will indicate when it expires. B) Shift Codes can also expire after a certain number of people have used them. Usually after 10,000 people (or more/less) used them. Note: Shift Codes from for example Borderlands 2 do NOT carry over to Borderlands: The Pre-Sequel or 1. Each Shift Code is game-specific. Big thanks to Mixer, Gearbox Software, Borderlands & Randy Pitchford for continuing to supply new Shift Codes. 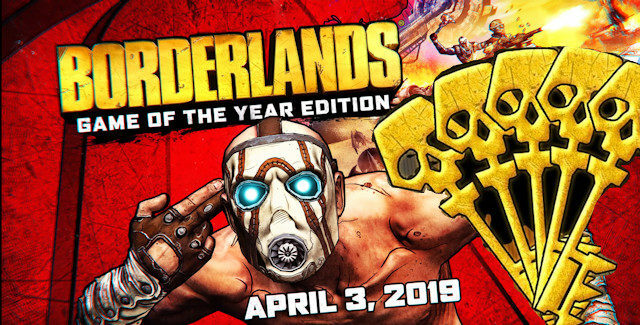 Please comment if you have found any additional Borderlands: Game of the Year Edition Shift Codes. We’ll give you credit for it. – Thanks for visiting!